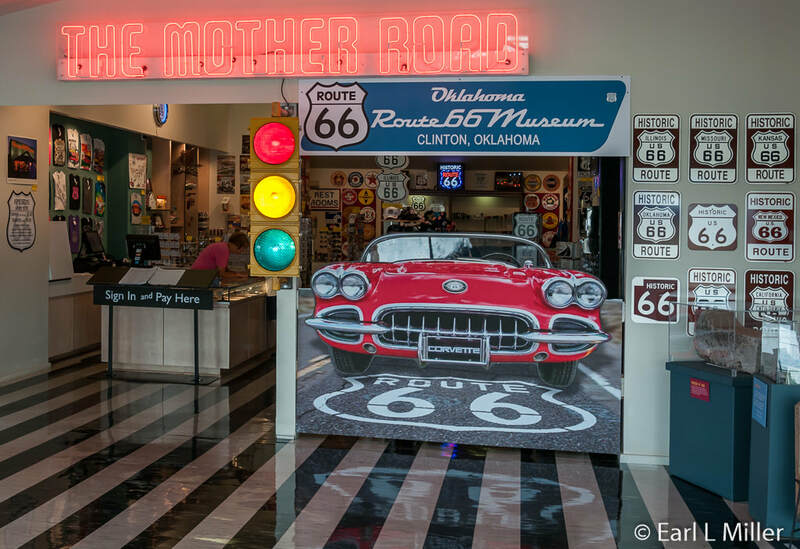 Known also as the Will Rogers Highway, Main Street of America, and the Mother Road, Route 66 played a vital part in American culture from its establishment in 1926 until its decertification in 1985. The route promoted commerce and mom and pop businesses, served the migration from the Dust Bowl states, and allowed the military to more easily mobilize during World War II. It also became a key incentive for family vacations and the Hippie movement. 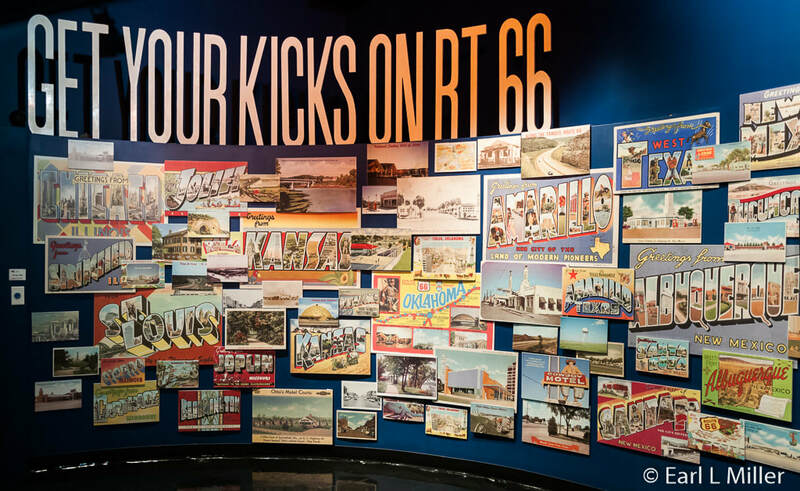 One of the best places to learn more about Route 66 is at Clinton, Oklahoma’s Route 66 Museum. 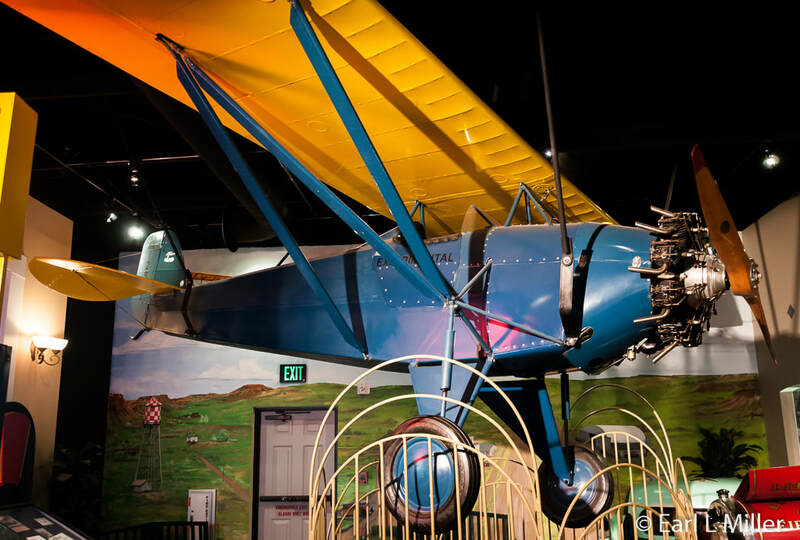 It’s a lasting tribute to the entire route where exhibits are arranged by decades in chronological order from the 1920's through the 1970's. Visitors learn about each era’s impact while viewing a large number of historical photographs, signs, and artifacts. 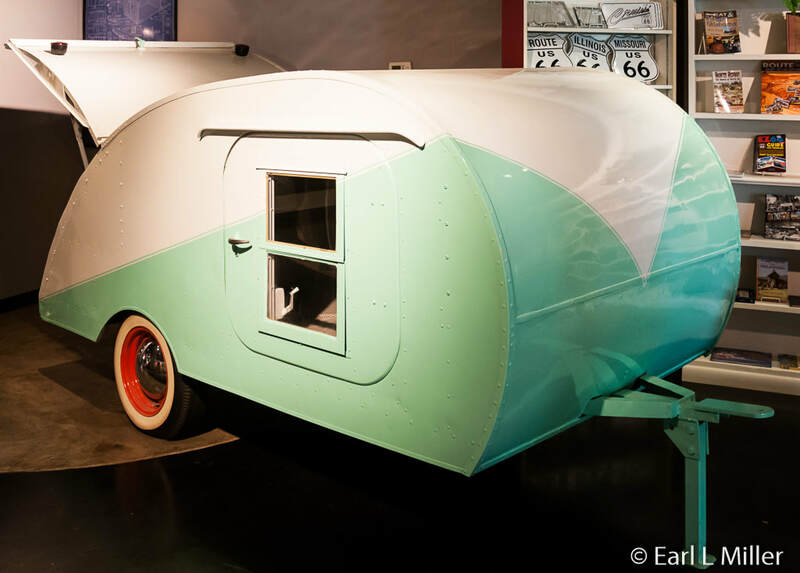 ​We found it an excellent place to visit for the route’s history, particularly that of Oklahoma's. Upon entering, visitors discover a 1969 Ford Mustang. 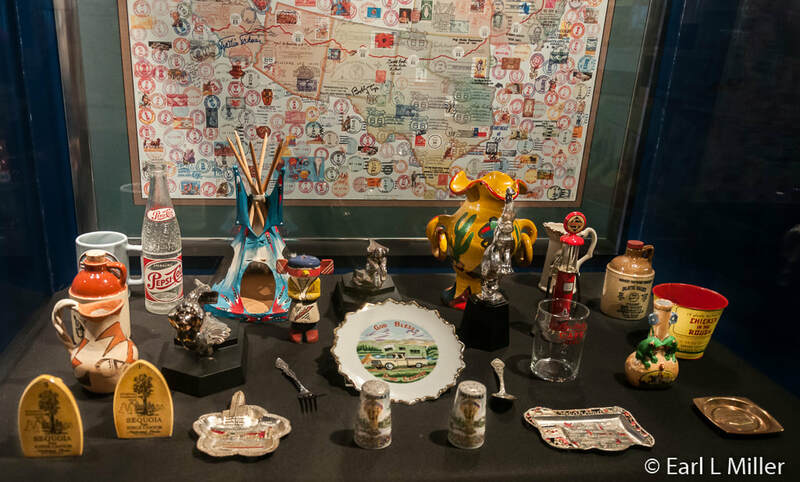 They’re then greeted with an introduction room full of souvenirs collected by those who traveled Route 66. It’s full of bottles, glasses, hood ornaments, and salt and pepper shakers. One wall consists of blow-ups of postcards representing different areas the road traveled through. In 1893, the National Good Roads Association formed. Its primary purpose was to foster good road construction and maintenance in order to increase commercial enterprises. In 1921, the Federal Highway Act was passed. This act started the development of a national highway system providing for a program that matched the federal highway funds 50-50 for state highway construction. More than $75 million in highway monies were given to the states by the end of 1921. The states adopted a nationwide network of numbered highways named auto trails. These were marked by private organizations. A 2.5 cents per gallon federal tax was passed in 1923 to support construction and maintenance of these roads. On the museum’s walls are signs displaying information on these trails before the National Highway System was created. It consisted nationally of 250 trails and highways. At least 18 of these in Oklahoma were used to form Route 66. Of the 2,448 miles which made up Route 66, 800 of these were already paved. The remaining 1,648 miles were graded with dirt or gravel, covered with asphalt, or were plank roads. It took until 1937 to pave the entire Route 66. In 1925, Cyrus Avery of Tulsa, Oklahoma and John Woodruff of Springfield, Missouri lobbied the American Association of State Highway Officials to create a route between Chicago and Los Angeles. Avery was the first chairman of the state highway association. Avery, Frank Sheets, chief engineer of the Illinois Highway Department, and B. H. Piepmier, chief engineer for the Missouri Highway Department, came up with the plans for Route 66. Their intention was to connect the main streets of urban and rural communities so that small towns would have access to a major national road. Another purpose was to transport commerce. The route would take crops to market, natural resources to factories, and distribute consumer goods to people. They submitted their plan to the national board of the National Highway Association on October 30, 1925. It was to run between Grant Park, Chicago to Santa Monica Pier in Santa Monica, California. Although the route did reach Santa Monica eventually, it never arrived at the pier. It would wind through eight states and three times zones - Central, Mountain, and Pacific. Oklahoma had the most driving miles - 432. In this room, you’ll discover photos of the late 1920's and of the 1930's. You’ll spot the horse drawn grader. It was a sled that dug into the dirt and couldn’t back up. It was pulled by horses and mules. Between the 1910's and 1930's, the growth of automobile ownership was massive. For example, in Oklahoma in 1914, 9,000 cars were owned. By 1920, it was 144,000 and by 1930, it had reached 576,046 automobiles. The filling station became more prominent. 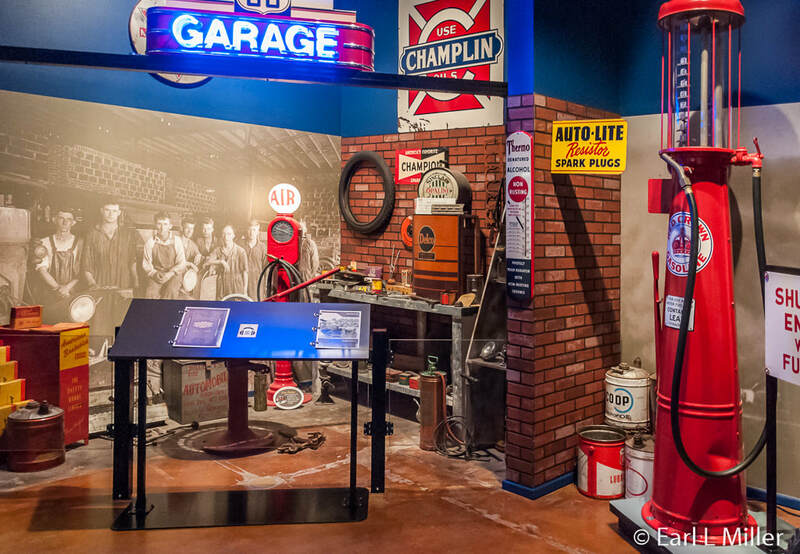 Before gas stations, fuel could be purchased at liveries, repair shops, and general stores. By the late 1920's, these stations became lifelines on Route 66 every 70 miles. In 1928, the U.S. Highway 66 Association made its first attempt at publicity with a race called the “Bunion Derby.” It was a footrace from Los Angeles to Madison Square Gardens in New York City on Route 66. It began March 4, 1928 with 275 starters and finished 84 days later. The winner was Andy Harley Payne, a Cherokee from Oklahoma who won the $25,000 first prize. A major event for this decade was the Dust Bowl. It was a drought which occurred in Oklahoma, Texas, Kansas, and Colorado which led to a migration of many from these states to California. In Oklahoma, 60,000 people left. The plight of these people was brought to Americans’ attention by John Steinbeck’s novel The Grapes of Wrath published in 1934. The Depression led to the employment of many government workers. As district manager of the Works Progress Administration, Avery committed the resources of the federal government to completing the route’s pavement. In 1933, the National Industrial Recovery Act provided $9.2 million for road work in Oklahoma. Four years later, $4 million more was allowed for more of Oklahoma’s road projects. The last dirt road stretch of Route 66 in Oklahoma was paved in 1937. The improvement of roads such as Route 66 also caused a rising death rate from automobile accidents. Major causes were the automobile’s increased speed and the new V-8 engines. For example, in Oklahoma during 1920, there were 100 deaths; by 1930, 400; and by 1936, 685 recorded. In 1937, to counteract this, Oklahoma’s state legislature created the Oklahoma Highway Patrol, using cruisers and Indian motorcycles, to enforce speed limits and issue drivers’ licenses. In this section, look for the 1926 International Truck and the sign relating how Phillips 66 got its name. 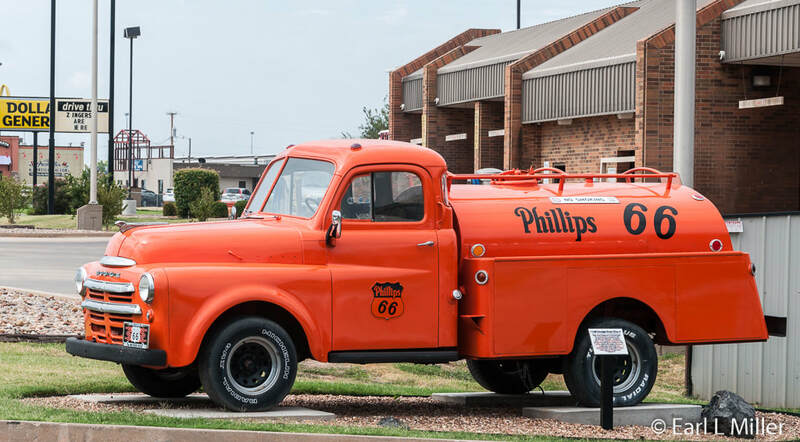 Phillips Petroleum, a Bartlesville, Oklahoma company, refined its first gasoline in 1927. Although the fuel had a specific gravity of 66 (not related to octane) and one of its refineries was located on Route 66, neither factor led to its name. Phillips executives wanted a special name for its first service station opening November of 1927. They called an important meeting. Two company executives were traveling on Route 66 in the Tulsa area. One remarked. “This car goes like 60 on our new gas.” The other replied, “60 nothing. We’re doing 66.” When the incident was reported at the meeting, the name was voted in unanimously. This section concentrates on the effect of World War II, the growth of bus lines, and the development of the trucking industry. During this era, parking meters were invented by two Oklahoma State University professors. The first ones were installed in Oklahoma City in 1935. During the war, more migration occurred because of war related industries in California. Speed limits were lowered to 35 m.p.h. to make rubber tires last longer. There was also gas rationing. To save on gas, people shared rides, took buses, and hitchhiked. Route 66 became a major artery for soldiers and military materials. Hitchhiking became a popular way for soldiers and sailors to get home before they shipped out. Bus lines, such as Greyhound born in the 1920's, boomed in the 1930's and 1940's. They had permits from state commissions to operate fixed routes. Buses stopped at gas stations, hotels, grocery stores, and restaurants to pick up and leave off passengers. They would stop if a flag was hung outside an establishment. It was replaced later by a light. Bus traffic peaked after the war. In 1944, Oklahoma had 31 bus companies. The heaviest traffic was along Route 66. Several towns had eight different bus companies. Claremore, Chandler, El Reno, and Clinton had at least four. In 1929, registration laws set by state legislatures had set truck rates and routes. Paved roads during the 1940's opened small towns and rural consumers to truck deliveries. The expansion of defense plants and military facilities during World War II spurred the growth of trucking firms. Defense plants existed at Tulsa, Oklahoma City, and Clinton. One trucking firm was the Clinton Transfer and Storage Company. In February 1930, they had a scheduled truck line from Oklahoma City to the Texas border. In December 1931, International Trucks served 84 towns in western Oklahoma. The company had 93 employees with 60 trucks. 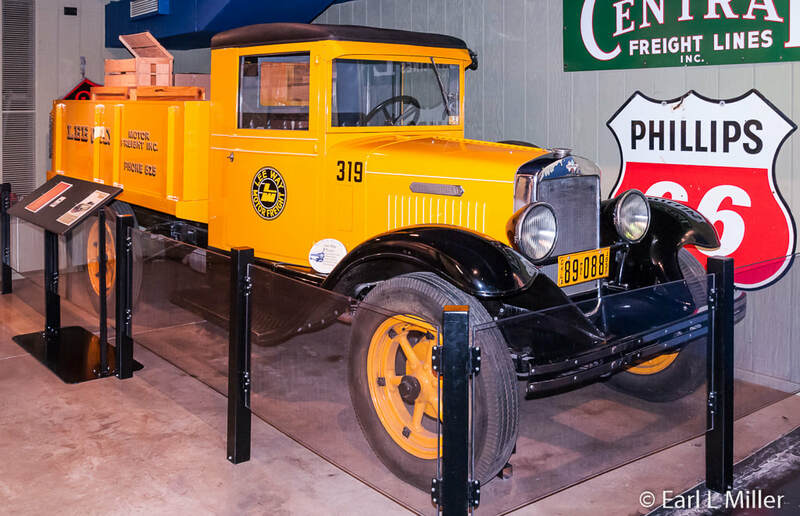 In this section, look for the 1932 International truck used to haul freight. And who can forget Bobby Troup, a marine in World War II, who penned the song “Get Your Kicks on Route 66?” It was first made popular by Nat King Cole then recorded by everyone from Chuck Berry, Perry Como, to the Rolling Stones. The movie Cars also brings Route 66 to mind. The room here resembles one of the diners during the 1950's. Family vacations soon became popular with services growing to handle their needs. Look for the 1941 Ford on display. It still runs. Many restaurants, gas stations, and curio shops sold items and services along Route 66 to travelers. At drive-ins, it was time for people to stay in their cars while carhops brought them their food. Fast food restaurants developed, too. The first McDonalds opened in San Bernardino, California. Red’s Giant Hamburg in Springfield, Missouri was the site of the first drive through restaurant. Cafes, diners, and drive-ins marketed using promotional give-aways with their early logos. Some companies doing this were Beverly’s Chicken in the Rough, Big Boy, The Tiny Diner Café, and A&W Root beer. Beverly and Rudy Osborne established their first Chicken in the Rough Restaurant in 1936 in Oklahoma City. They were known for their half of a fried chicken accompanied by shoestring potatoes and a biscuit with honey. Initially, it had nine stools and four booths, It later expanded to serve 1,100 people. Bob Hope and Gene Autry are known to have stopped there. In 1961, the building was demolished and the state capitol complex erected there. This restaurant was the first in the United States to license franchise restaurants. The popularity of Chicken in the Rough Restaurants spread across the country. Now only three restaurants remain - two at Port Huron, Michigan and one in Canada The Osbornes used a campaign with a post card to promote their chain. The program consisted of three steps with the first person completing it being awarded $100. These consisted of visiting 25 different restaurants in the first six months of each year, obtaining managers' signatures, and mailing the postcard from the towns where they visited the restaurant. 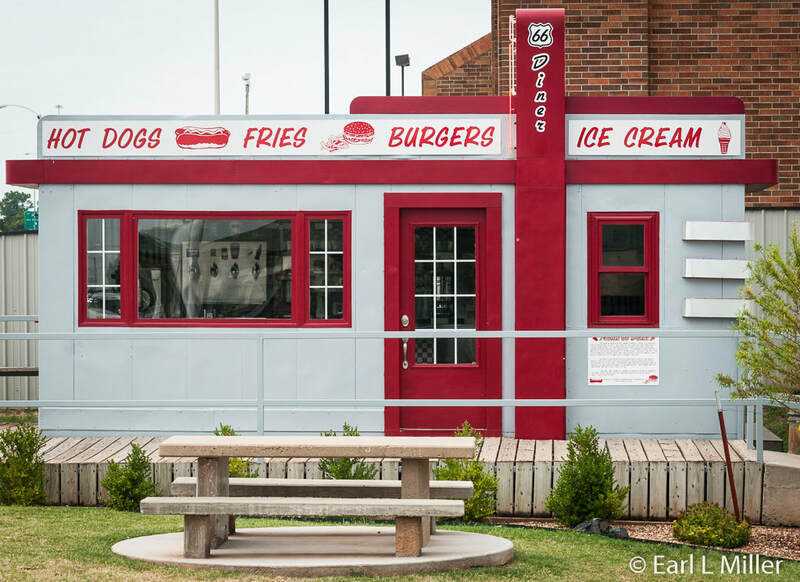 This chain paved the way for food franchises along Route 66. Diners were also prominent during the 1950's. In 1938, Kansans Ella and Arthur Valentine started manufacturing the Valentine Diner in Wichita, Kansas. Being the only significant diner manufacturer outside of the Northeast states, they produced the vast majority of diners used west of the Mississippi River. A prospective business owner could pay outright for these or pay monthly installments of $40. Another option was to deposit a percentage of daily profits into a lockbox outside of the restaurant. A representative of the Valentine Diner Company then collected these monies. The diners arrived with a grill, L-shaped counter, and five to ten stools. They were set up on a concrete foundation and operational within hours. Some also had a take-out window. Outside the museum, you will find a Valentine diner. It opened in 1956 as the Porter House Café in Shamrock, Texas. The owners, M. L. and Alta Porter, ran it until 1964. The museum acquired it in 2002 and restored it. 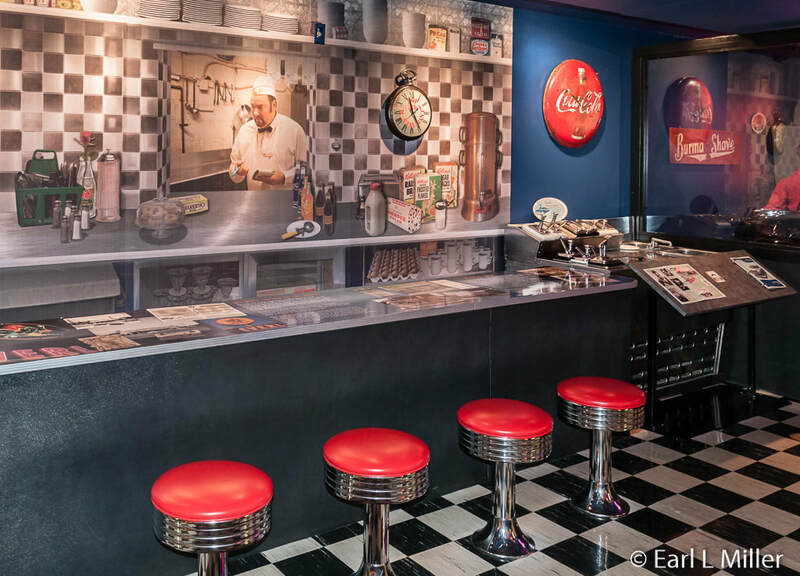 During special events, the museum serves Moon Pies and Route 66 root beer in the diner. The drive-in theater also was popular in the 1950's along Route 66. It was the idea of Richard Hollingshead Jr. of Camden, New Jersey. In his own home, he mounted a 1928 Kodak projector on the hood of his car and projected onto a screen he had nailed to trees in his backyard.. He opened his first commercial drive-in in 1933 with a 30x40 foot screen that accommodated 400 cars. A speaker was mounted next to the screen for sound. His drive-in only lasted three years, but the idea caught on around the country. Over time, these theaters added such attractions as miniature golf courses, boat rides, and concessions. Sound in the 1950's came from individual volume-controlled speakers that hung on car windows. One advertisement people noticed as they drove along Route 66 were the Burma Shave Signs from 1925 to 1963. At its height, 7,000 signs lined American roads. The 1960's was known for the continued growth of family vacations and for the Hippie generation. 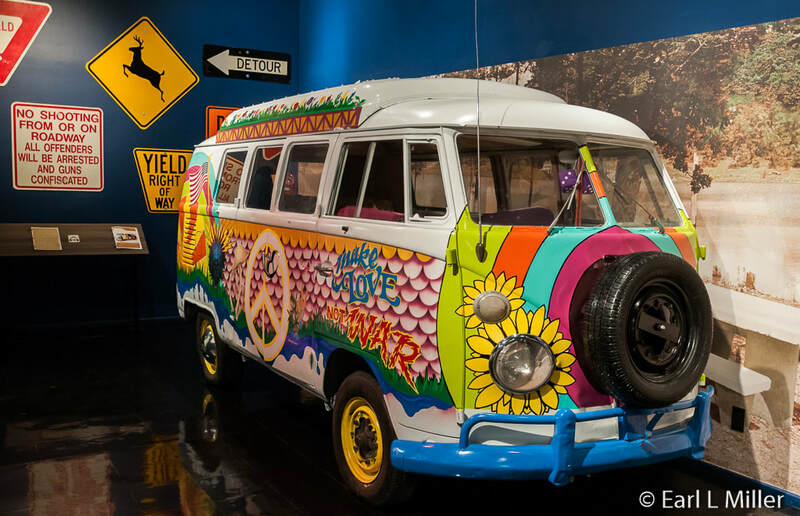 Take note of the 1964 psychedelic Volkswagen van and the 1960 Rambler in this section. This decade led to a variety of overnight accommodations. Large facilities were constructed by such hotel industry leaders as Hilton and Sheraton. New companies such as Holiday Inn, Ramada Inn, and Marriott emerged. Many independents such as Best Western affiliated themselves with national marketing associations. 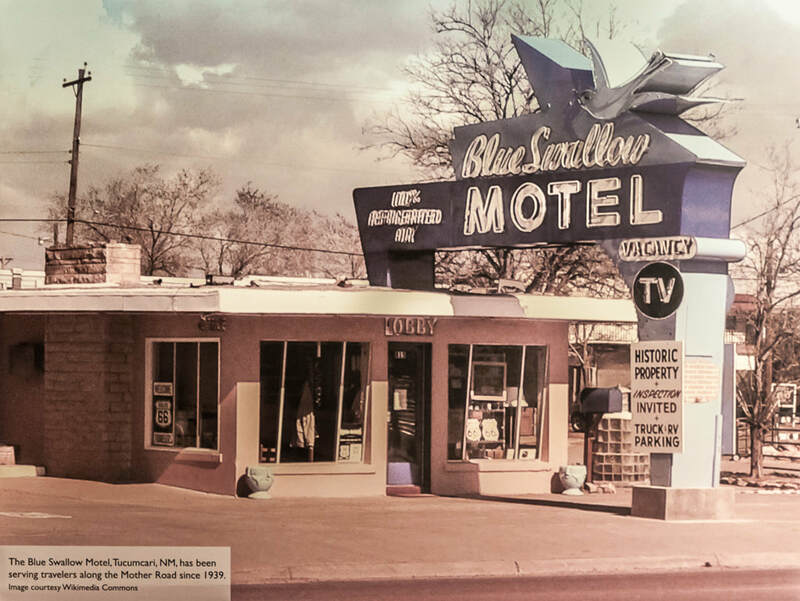 One motel, still standing in Tucumcari, New Mexico, is the Blue Swallow Motel. It has been serving Route 66 travelers since 1939. Note that each of its units has a garage. These were a definite step up from the campsite cabins that developed during the 1920's near business districts and later on the edge of town. Campsite cabins were equipped with cots, chairs, and camp stoves. They cost the traveler from 50 to 74 cents per night. By 1926, most cabins included a bed, table, and a water pitcher. Family vacations of ten days and two weeks continued to grow in popularity. Hot spots for travelers were such places as the Grand Canyon, Meramec Caverns near St. Louis, Disneyland, and Knotts Berry Farm in California. Travel games and novelties flooded the markets in the 1950's and 1960's. From 1960 to 1964, the famous television series, Route 66, aired. It starred Martin Milner as Tod Stiles and George Maharis as Buz Murdock on their job-hunting travels across America in their Corvette. It was shot on location in more than 20 states and Canada. Guest stars ranged from Joan Crawford to a young Robert Redford. 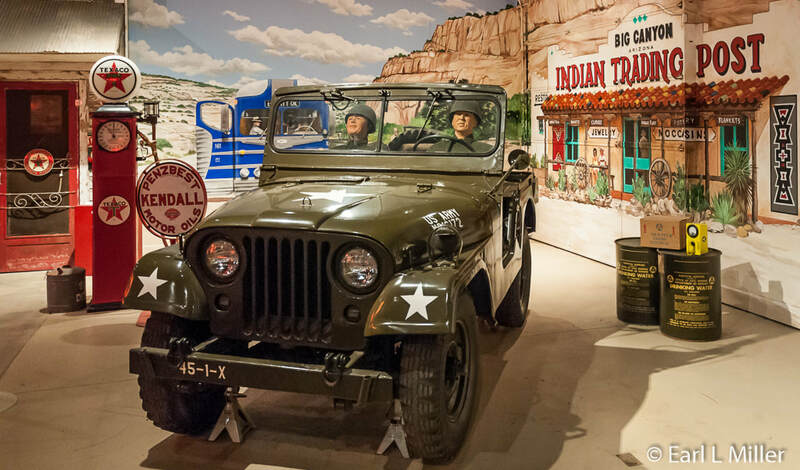 After taking this wonderful historical timeline through the museum,spend 20 minutes to view their historical video on Route 66, called The Legend. Family vacations continued to be popular with some still traveling in the Volkswagen bus. The movie camera came into play so families could record their memories. Unfortunately, President Eisenhower’s Interstate Highway Act signed into law on June 26, 1956 to develop interstates meant an eventual end to Route 66. He had been influenced in 1919 as a young Army officer crossing the country in a truck convoy and by his appreciation of Germany’s autobahn network. The act allocated over $30 billion for the construction of over 40,000 miles of interstate highways, the largest public construction project in U.S. history at the time. Route 66 was eventually replaced by five interstates. More and more interstates were built and Route 66 was officially removed from the U.S. highway system on June 27, 1985. In Oklahoma, a north/south stretch of I-35 was followed by an east/west stretch on I-40 during the early 1970's in western Oklahoma. This made it possible to drive from Miami, Oklahoma to Texola, Oklahoma without being on Route 66. Route 66 associations in all Route 66 states, plus others across the globe, continue to promote and protect renewal efforts. These are supported by the various state departments of transportation and include marking the route as a historical highway in every state in which it passes. Current promotion focuses on the route’s cultural and historical significance and its effect on the people along the route. Eighty-five percent of the road is still drivable. The final room in the museum is their temporary exhibit room. The display we saw was devoted to folk art. We found all kinds of interesting artifacts here. It leads to a large gift shop which is loaded with Route 66 souvenirs and an excellent selection of books. Besides the Valentine Diner, outside the museum, you find an Archer cement mixer. 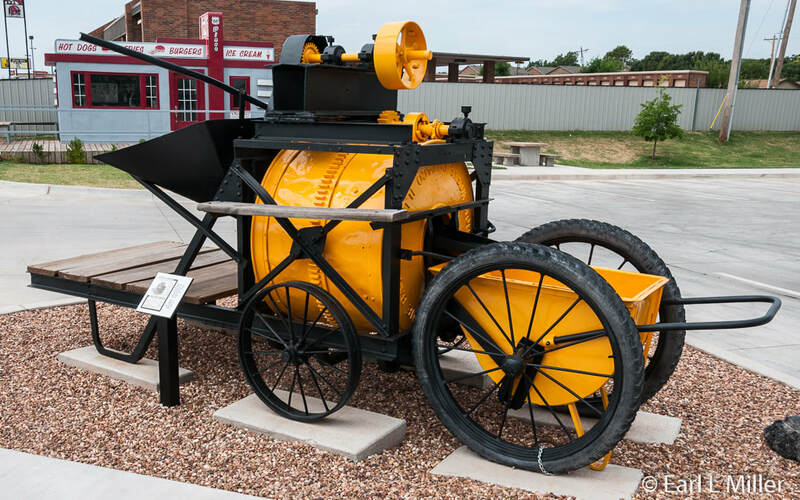 It was part of the equipment owned and used by the Oklahoma Department of Transportation during the construction of Route 66. This machine took three men to mix and pour the cement. It delivered the wet mix delivered directly onto forms. Visitors also find a Phillips 66 fuel truck. It’s a 1948 Dodge 3/4 ton truck which had a six cylinder engine. This series was manufactured from 1948 to 1953 and replaced the pre-war Dodge truck. 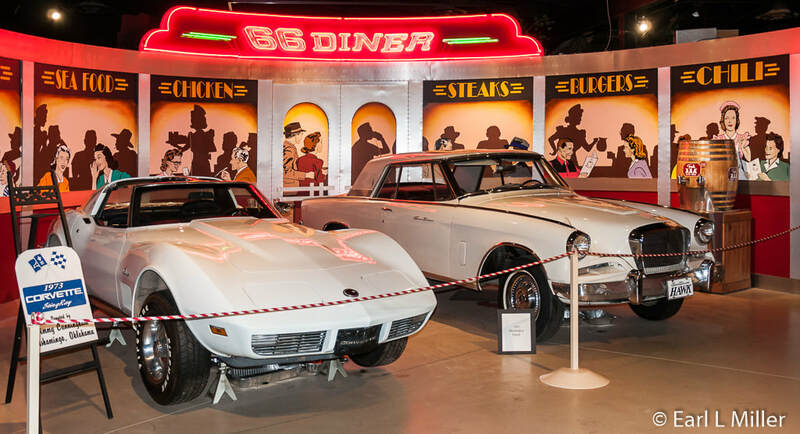 You will find the Oklahoma Route 66 Museum, run by the Oklahoma Historical Society, at 2229 W. Gary Blvd, Clinton, Oklahoma. Its telephone number is (580) 323-7866. The hours are 9:00 a.m. to 5:00 p.m Monday through Saturday with extended hours to 7:00 p.m. May 1 through August 31. During January and February, they are closed on Mondays and Sundays. During the remainder of the year, they are open on Sundays from 1:00 to 5:00 p.m. Admission is $7 for adults, $5 for seniors ages 62+, and $4 for ages 6-18. Ages 5 and under are free. It’s also free for veterans and active military. The National Route 66 Museum is not separate but a part of Elk City’s Old Town Museum. They have a transportation museum, farm and ranch museum, and a blacksmith shop. Their two story Victorian house takes visitors on the lower level through a Stars & Stripes Room; Native American gallery; and exhibits on Elk City’s Miss America of 1981, Susan Powell. Upstairs they have items on display about the early cowboys and rodeo way of life. Many have been donated by Beutler Brothers Rodeo Stock Producers. This museum is seen through self guided tours as you tour various pioneer buildings. Only the drug store where they sell stick candy and soda pop, the caboose, and. the livery stable were open. We were not impressed and spent very little time seeing this portion. Their transportation museum, that opened in 2006, at the building where you pay admission, is tiny. Of interest was the 1937 tear drop trailer which came as a kit. 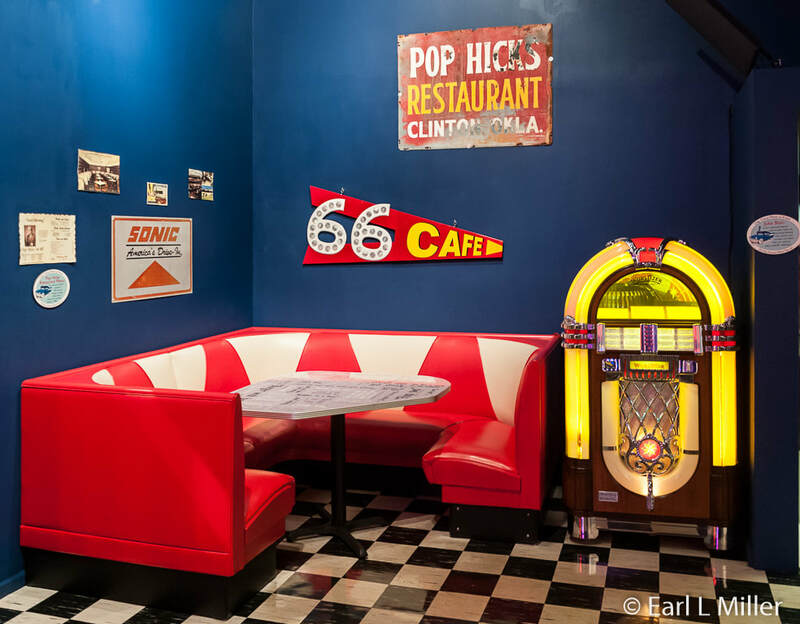 Visitors can watch a video of Route 66 scenery and pretend they’re sitting in half of a 1955 pink Cadillac. They can also watch scenes from Creature from the Black Lagoon at a mock drive-in theater while sitting in half of a classic Chevy Impala. Those were the highlights for me. Their plane is an experimental Corben aircraft hanging from the ceiling. It was serial number two out of five. They do have a series of motorcycles on exhibit. These are a 1946 Harley “El” Madel’ a 1965 Harley “Electra” Glide, a 1940 Indian “Chief” and a 1950 Cushman Scooter “Eagle.” A 1917 fire engine is on view. Totally out of place is a room donated to Popeye, Fred Flintstone, and Charlie Brown figurines, lamps, and music boxes. The American Dream and the American Drive is a 15 minute video on the history of transportation. It touches on the national roads, transcontinental railroad, and early motorcycles. The displays in this section, besides a time line, are a walk through series of dioramas tracing Route 66 from Chicago to Los Angeles. Each has a vintage car in front of it. Visitors can push interactive buttons then stand under domes to hear recordings relating individuals' experiences along each part of the route. Speakers relate memories of visiting small town museums, the Grand Canyon, and the Big Texan Steak Ranch in Amarillo. It starts in Chicago with a 1953 Lincoln Continental. It’s a scene of tourist courts and burger joints with car hops. 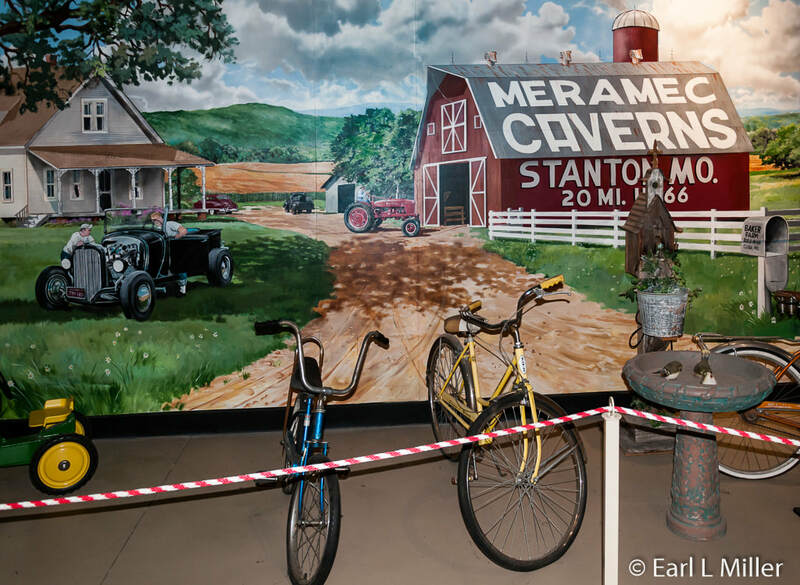 The next has bicycles in front of a mural of Meremac Caverns in Stanton, Missouri. A 1928 Model A stands in front of an Oklahoma scene. There is a scene of a Phillips 66 station near Bartlesville, Oklahoma. The tape tells how Phillips 66 got its name. Under the same dome, you hear a story about setting up trailer rigs at Elk City. Proceeding on to Tucumcari, visitors see a 1919 Ford model T cab farmer’s truck. Simulating New Mexico is an Indian with his dog in front of hotel and restaurant signs. 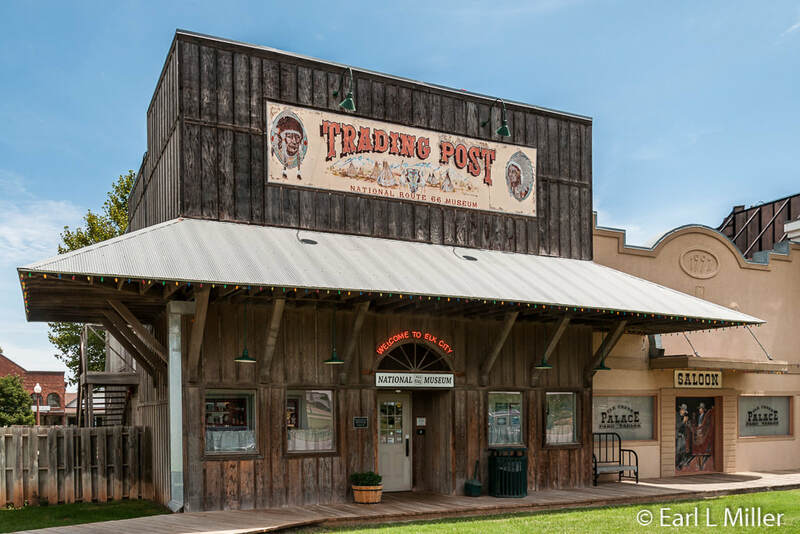 You’ll hear the story of Tucumcari and Santa Rosa as popular stopping points Next is Big Canyon Indian Trading Post in Arizona with a Willy’s Jeep in Front. Signifying California is a movie director scene with a truck - a 1928 Ford. The last scene is of a Route 66 diner. In front of it are a 1962 Studebaker Hawk and a 1973 Corvette. A wall is lined with Old Oklahoma license plates. That’s one’s total experience here. We were disappointed in this museum. To call themselves a national museum is mismarketing, and we won’t visit again. 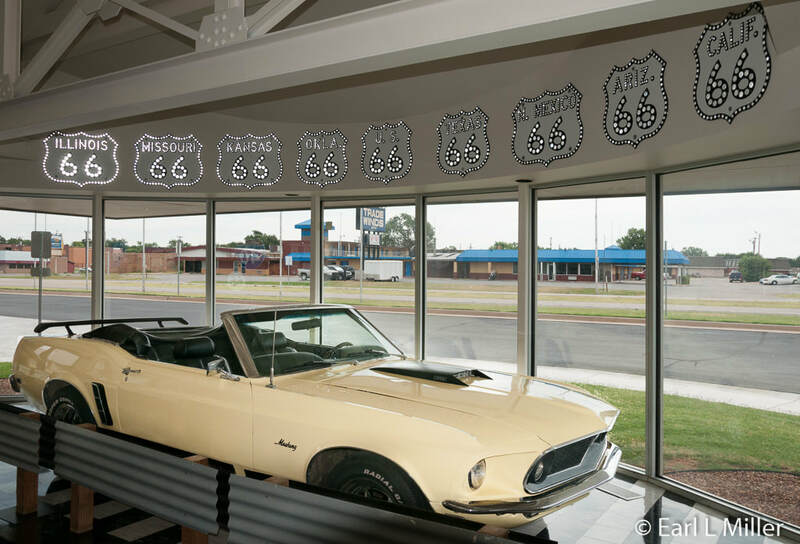 We suggest spending all your time at the Clinton, Oklahoma Route 66 museum instead. Elk City is located 25 miles west of Clinton. The museum’s address is 2717 W. Highway 66. The phone number is (580) 225-6266. Hours are Memorial Day through Labor Day, Monday through Saturday 9:00 a.m. to 7:00 p.m. and Sunday 2:00 to 5:00 p.m. During the rest of the year, they are open Monday through Saturday 8:00 a.m. to 5:00 p.m. and closed on Sunday. Admission is $5 for adults; AAA, ages 60+ , and children ages 5-16 pay $4. Under age 5, it’s free. While on our Ohio trip from Arizona, we camped overnight at Tucumcari, New Mexico. In both directions, we stopped at Del’s Restaurant, a fixture on Route 66 since 1956. The menu concentrates on American comfort food with beef, chicken, and fish. They also offer a Mexican menu. Best sellers are sopaipillas, liver and onions, and chicken fried steak. Prices are moderate and portions are good-sized. The building we ate in dates to that year while an expansion was added in the 1970's. Their gift shop is heavy into Mexican goods. Visitors find Del’s at 1202 East Historic Route 66. The phone number is (575) 461-1740. Hours are Monday through Saturday from 11:00 a.m. to 9:00 p.m. While in town, take a look at Main Street at motels, such as the Blue Swallow, dating from the 1930's. 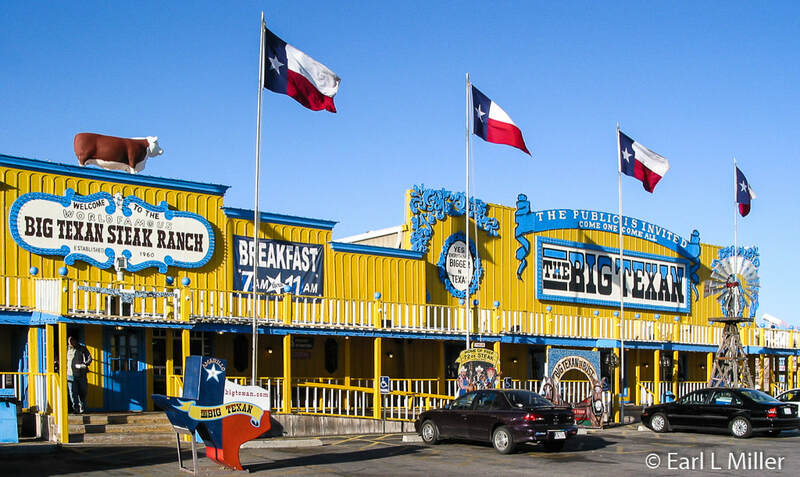 Originally on Route 66, The Big Texan Steak Ranch, in Amarillo, can be found today at 7701 Interstate 40 Access Road. 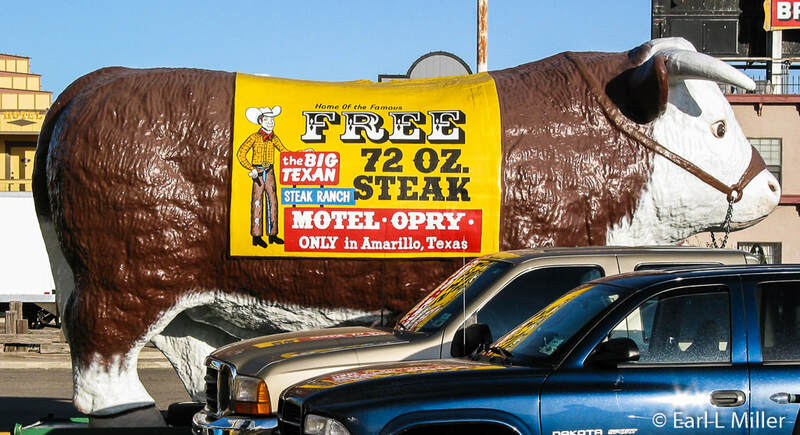 It opened in 1960 and started its challenge in 1962 that anyone who could consume a 72-ounce steak dinner in one hour would receive it for free. Those who attempt this task also have to eat a shrimp cocktail, baked potato, salad, and roll and butter within that time frame. We have eaten here many times when traveling between Arizona and Ohio and the food and service have never disappointed us. We admit that we never tried the challenge. 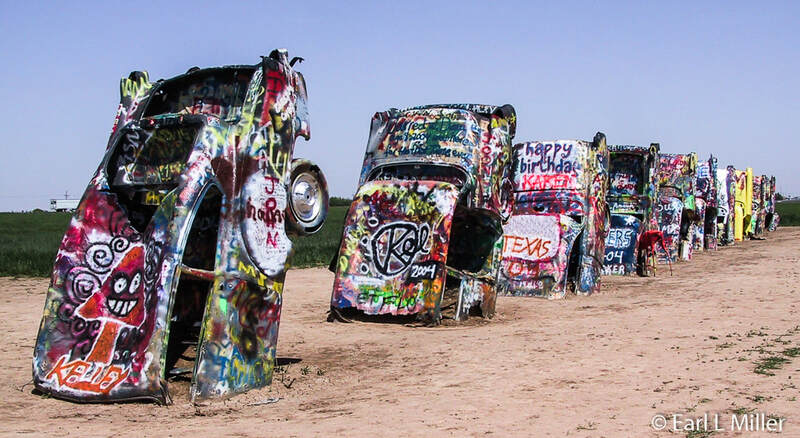 A Mecca for Route 66 visitors is Cadillac Ranch located on the west side of Amarillo. It’s in a field between I-40 exits #60 and #62 on the south side. An art co-op, the Ant Farm, assembled seven upended, decorated Cadillacs. They are said to be positioned at the same angle as the sides of the Great Pyramids of Egypt. They were moved here from their original site after 20 some odd years. The photo at the top of this article is the sign on the side of Clinton's Route 66 Museum. REMEMBER: Free notification of future articles is available by filling out the form on the Contact page.